How To Use Vivo Y71 User Lock Remove Tool? First of all, make sure you are using the Vivo Y71 android mobile. Now boot your device into EDL 9008 mode. 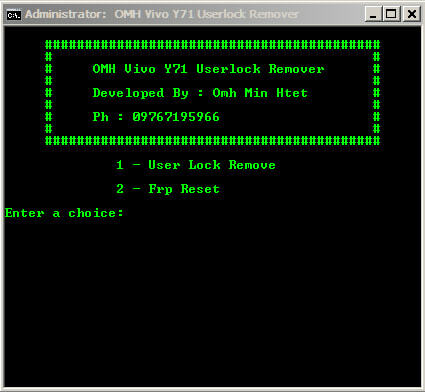 Run Vivo Y71 User Lock Remove Tool on pc as administrator. Connect the device with pc via USB cable. Driver installation will start automatically. Wait to complete the installation first. After driver installation, Press “1” to remove Vivo Y71 user lock or select the 2 for FRP Bypass. In the next step, follow the on-screen instructions to bypass user lock on your device. Compatible: The above software runs smoothly on Windows XP, Windows Vista, Windows 7, Windows 8, Windows 8.1 and Windows 10 (32 bit and 64 bit). Take a Backup: If you are going to try the above tool, then please take a backup of your Android Smartphone or Tablet as flashing any recovery or file may brick the device. Other Tools: If you are searching for other useful tools then follow our Tools Section to download free SM Tools. Credits: Oppo User Lock Remove Tool is created and distributed by OMH (developer).